Nick Diakopoulos » Comment Readers Want Relevance! A couple years ago now I wrote a paper about the quality of comments on online news stories. For the paper I surveyed a number of commenters on sacbee.com about their commenting experience on that site. One of the aspects of the experience that users complained about was that comments were often off-topic: that comments weren’t germane, or relevant, to the conversation or to the article to which they were attached. This isn’t surprising, right? If you’ve ever read into an online comment thread you know there’s a lot of irrelevant things that people are posting. It stands to reason then that if we can make news comments more relevant then people might come away more satisfied from the online commenting experience; that they might be more apt to read and find and learn new things if the signal to noise ratio was a bit higher. The point of my post here is to show you that there’s a straightforward and easy-to-implement way to provide this relevance that coincides with both users’ and editors notions of “quality comments”. I collected data in July via the New York Times API, including 370 articles and 76,086 comments oriented around the topic of climate change. More specifically I searched for articles containing the phrase “climate change” and then collected all articles which had comments (since not all NYT articles have comments). For each comment I also had a number of pieces of metadata, including: (1) the number of times the comment was “recommended” by someone upvoting it, and (2) whether the comment was an “editor’s selection”. Both of these ratings indicate “quality”; one from the users’ point of view and the other from the editors’. And both of these ratings in fact correlate with a simple measure of relevance as I’ll describe next. In the dataset I collected I also had the full text of both the comments and the articles. Using some basic IR ninjitsu I then normalized the text, stop-worded it (using NLTK), and stemmed the words using the Porter stemming algorithm. This leaves us with cleaner, less noisy text to work with. I then computed relevance between each comment and its parent article by taking the dot product (cosine distance) of unigram feature vectors of tf-idf scores. For the sake of the tf-idf scores, each comment was considered a document, and only unigrams that occurred at least 10 times in the dataset were considered in the feature vectors (again to reduce noise). The outcome of this process is that for each comment-article pair I now had a score (between 0 and 1) representing similarity in the words used in the comment and those used in the article. So a score of 1 would indicate that the comment and article were using identical vocabulary whereas a score of 0 would indicate that the comment and article used no words in common. So, what’s interesting is that this simple-to-compute metric for relevance is highly correlated to the recommendation score and editor’s selection ratings mentioned above. The following graph shows the average comment to article similarity score over each recommendation score up to 50 (red dots), and a moving average trend line (blue). 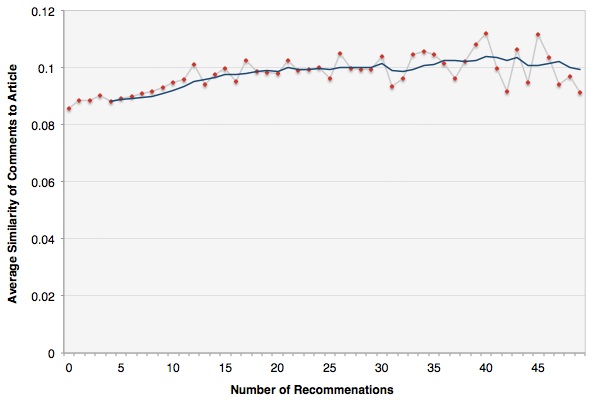 As you get into the higher recommendation scores there’s more variance because it’s averaging less values. But you can see a clear trend that as the number of recommendation ratings increases so too does the average comment to article similarity. In statistical terms, Pearson’s correlation is r=0.58 (p < .001). There’s actually a fair amount of variance around each of those means though, and the next graph shows the distribution of similarity values for each recommendation score. 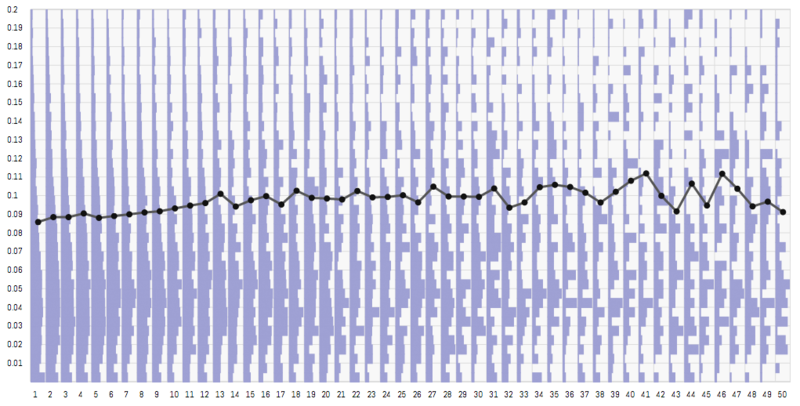 If you turn your head side-ways each column is a histogram of the similarity values. We can also look at the relationship between comment to article similarity in terms of editors’ selections, certain comments that have been elevated in the user interface by editors. The average similarity for comments that are not editors’ selections is 0.091 (N=73,723) whereas for comments that are editors’ selections the average is 0.118 (N=2363). A t-test between these distributions indicates that the difference in means is statistically significant (p < .0001). So what we learn from this is that editors’ criteria for selecting comments also correlates to the similarity in language used between the comment and article. The implications of these findings are relatively straightforward. A simple metric of similarity (or relevance) correlates well to notions of “recommendation” and editorial selection. This metric could be surfaced in a commenting system user interface to allow users to rank comments based on how similar they are to an article, without having to wait for recommendation scores or editorial selections. In the future I’d like to look into ways to assess how predicative such metrics are in terms of recommendation scores, as well as try out different metrics of similarity, like KL divergence. Posted on October 9, 2012 by Nick. This entry was posted in commenting, computational journalism, Uncategorized. Bookmark the permalink.